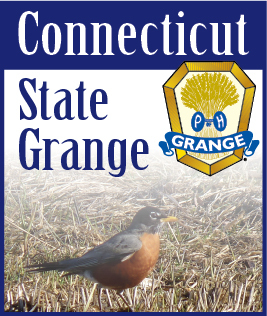 It was nice to see so many of you at Grange Sunday as we celebrated the Grange and all that it stands for. We had a tie for first place in the Talent Contest. Gail Prelli and Mary Lou Keefe representing Mountain County Pomona tied with Jane and Ruel Miller from New Haven County Pomona. Both plan on attending Lecturers’ Conference in Maine this August. The “A Number” contest was won by East Central Pomona with a skit entitled “Animal Rescue”. Lois Evankow’s picture was awarded Best in Show and will go on to National this fall. Now is the time to start thinking of next years contest. As you travel or have family cookouts or parties this summer don’t forget to get your camera out. Enjoy your summer and appreciate every nice day we have. Hope to see you in Maine at Lecturers Conference and around the State.